Fighting for under-desk space? The UPLIFT Track Spacer is an ideal addition to your workstation that can help you mount accessories like keyboard trays in a jiff, even on desks with existing crossbars. Its unique U-shaped design allows for it to connect over most crossbeams and your existing hardware without damaging your desk. Do I have to use a track spacer to get full retraction of my keyboard tray? If you have a crossbar mounted underneath your UPLIFT Desk, then yes you will need to install the Track Spacer in order to fully retract the keyboard tray. We do find that most people just leave their keyboard tray out even when not in use, so full retraction may not be necessary for you. Can this work with non-UPLIFT equipment? The UPLIFT Track Spacer may have the same mounting pattern as some Humanscale tracks. However, we cannot guarantee that it will work with anything but UPLIFT brand items. This track spacer will not work with Humanscale keyboard trays. What is the Track Spacer? The track spacer acts as a bridge, allowing you to mount your UPLIFT Desk CPU Holder or UPLIFT Desk Keyboard Tray tracks over the center support rails on your desk. Check out this video to see exactly how it works. Why would I want the Track Spacer? If you want to be able to push the keyboard tray straight under the desk and have it completely hidden, the track spacer will allow you to mount the 21" keyboard tray track over the crossbars of the desk. The track spacer can also be used to mount the 16" CPU track. You may find that you do not need the track spacer, but it gives you more flexibility when mounting under-desk accessories onto your UPLIFT Desk. 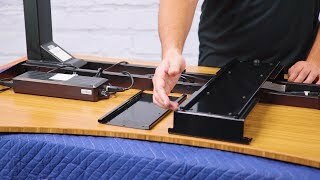 Do I need a track spacer if I'm installing an UPLIFT Desk Keyboard tray on my non-UPLIFT desk? You might need a track spacer if there is anything keeping you from installing the full length of the track. However, you will want to reach out to our Sales Pros to confirm that the UPLIFT Track Spacer will work with your current desk, as every desk is different. Do I need the Track Spacer? The Track Spacer is a handy item to have and will make mounting your under desk accessories easier. But, you can get around using the Track Spacer by installing the shorter depth keyboard tray and then just rotating your keyboard tray to hide it underneath your desk.